Just a few hours there was a subduction zone megathrust earthquake along the New Britain Trench in the western equatorial Pacific Ocean. 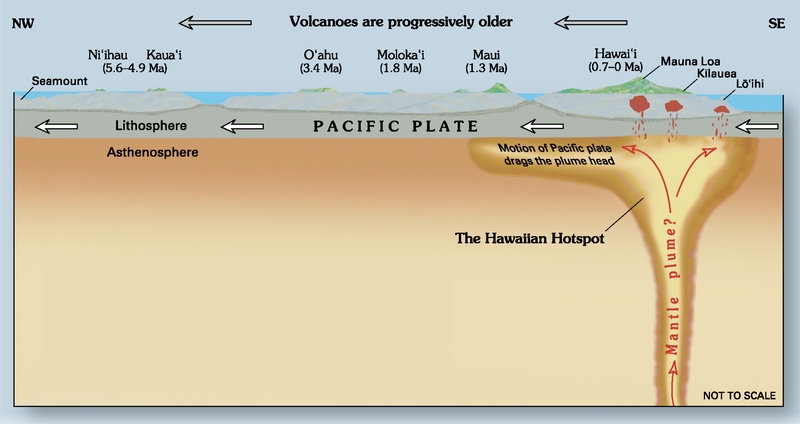 In this region of the world, the Solomon Sea plate and the South Bismarck plate converge to form a subduction zone, where the Solomon Sea plate is the oceanic crust diving beneath the S.Bismarck plate. The subduction zone forms the New Britain Trench with an axis that trends east-northeast. To the east of New Britain, the subduction zone bends to the southeast to form the San Cristobal and South Solomon trenches. Between these two subduction zones is a series of oceanic spreading ridges sequentially offset by transform (strike slip) faults. Earthquakes along the megathrust at the New Britain trench are oriented with the maximum compressive stress oriented north-northwest (perpendicular to the trench). Likewise, the subduction zone megathrust earthquakes along the S. Solomon trench compress in a northeasterly direction (perpendicular to that trench). There is also a great strike slip earthquake that shows that the transform faults are active. This earthquake was too small and too deep to generate a tsunami. I plot the seismicity from the past month, with color representing depth and diameter representing magnitude (see legend). I include earthquake epicenters from 1918-2018 with magnitudes M ≥ 7.5 in one version. We can see the roughly east-west trends of these red and blue stripes. These lines are parallel to the ocean spreading ridges from where they were formed. These stripes make evident the spreading centers south of the Solomon Sea plate, forming the Woodlark Basin. Note how the color bands along the spreading centers (orange arrows pointing in direction of plate motion). What color are they? Why? 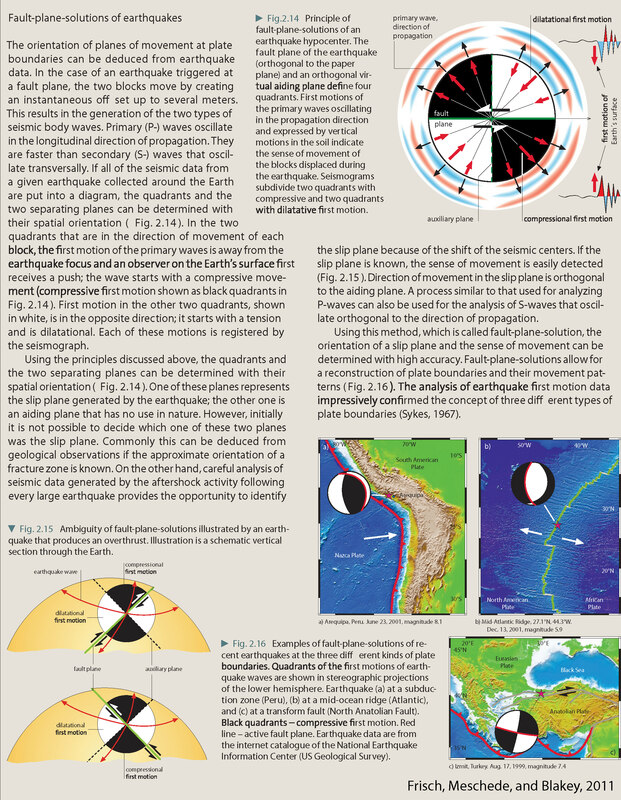 In the upper left corner is a general overview of the plate boundaries and mapped faults in the region (Koulali et al., 2015). I place a blue star in the general location of the M 7.0 epicenter. In the upper right corner is a more detailed tectonic map of the region, showing the ways that the S. Bismark plate is dissected by strike-slip faults. The active volcanoes are shown as red stars. 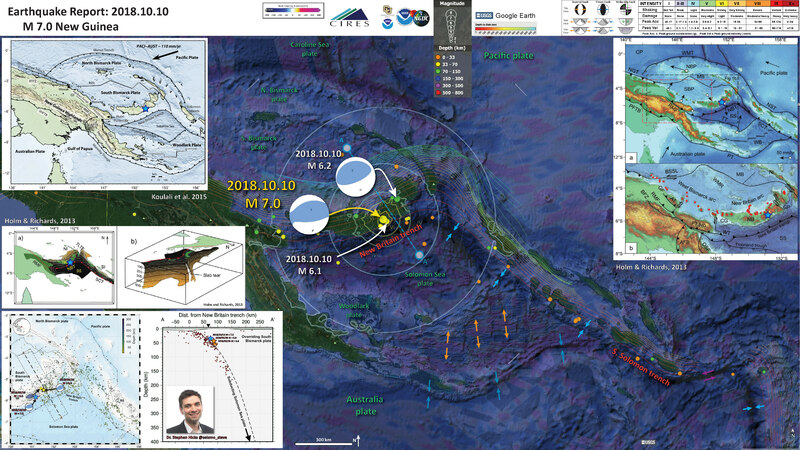 In the lower left corner are a couple figures Dr. Stephen Hicks prepared in response to an earthquake sequence earlier in 2018. On the left is a map showing recently observed seismicity. The seismicity that lies within the dashed box is used to plot the earthquakes with depth (the hypocenters). The March 2018 earthquakes are in yellow and orange. Today’s M 7.0 is shown as a blue star on both plots. The location of profile A-A’ is located in the general location on the earthquake interpretive poster. Above these figures is a figure pair from Holm & Richards (2013). On the left is a map that shows land in green and the subducting Solomon Sea plate in black that turns orange with depth. The image on the right is a low angle oblique view of the slab, shoing the shape of the plate in 3-D. Note the tear in the slab. Read more about this below. Here are the figures presented by Dr. Hicks. On March 26, 2018 there was an M 6.6 earthquake. Steve prepared these figures. 3 days later there was an M 6.9, which made the M 6.6 a foreshock. Today’s earthquake sequence also included a foreshock-mainshock sequence. There was an M 6.1 and 3 minutes later there was the M 7.0, making the M 6.1 a foreshock. We do not know if an earthquake is a foreshock until there is a larger magnitude earthquake later. Here is a visualization of the seismicity as presented by Dr. Steve Hicks. 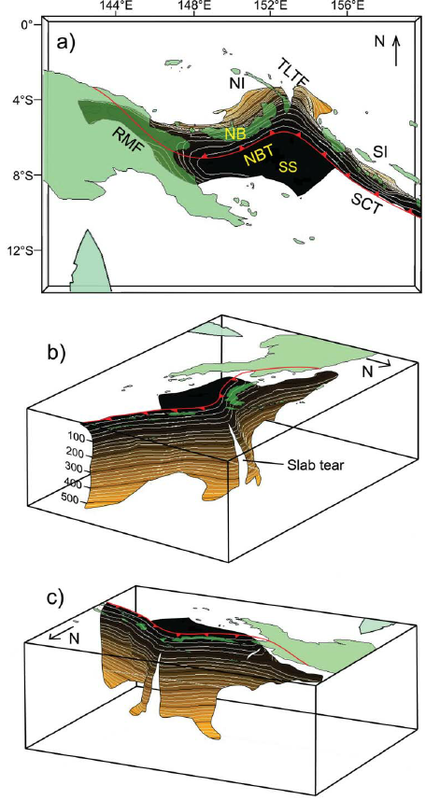 Topography, bathymetry and regional tectonic setting of New Guinea and Solomon Islands. Arrows indicate rate and direction of plate motion of the Australian and Pacific plates (MORVEL, DeMets et al., 2010); Mamberamo thrust belt, Indonesia (MTB); North Fiji Basin (NFB). Here is the slab interpretation for the New Britain region from Holm and Richards, 2013. I include the figure caption below as a blockquote. Here are the forward models for the slab in the New Britain region from Holm and Richards, 2013. I include the figure caption below as a blockquote. 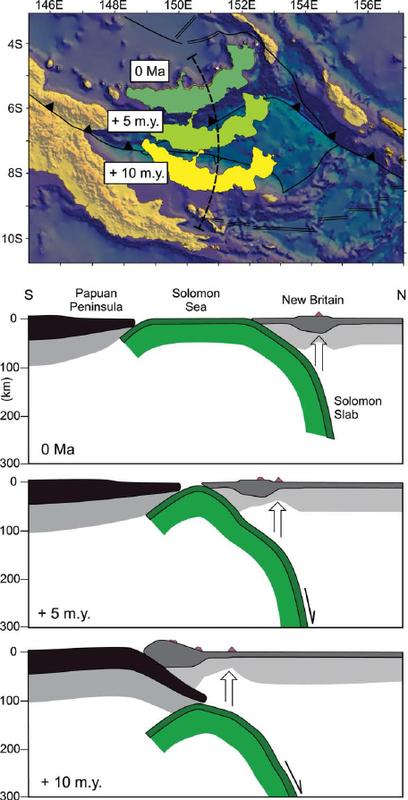 Forward tectonic reconstruction of progressive arc collision and accretion of New Britain to the Papua New Guinea margin. (a) Schematic forward reconstruction of New Britain relative to Papua New Guinea assuming continued northward motion of the Australian plate and clockwise rotation of the South Bismarck plate. (b) Cross-sections illustrate a conceptual interpretation of collision between New Britain and Papua New Guinea.